For Connecticut residents used to controversy surrounding Indian casinos, there is nothing all that new about Brett D. Fromson's explosive "inside story" of the unlikely revival of the Mashantucket Pequot Indians and the subsequent spawning of the world's biggest and most lucrative casino. Here it is, a decade after Foxwoods Resort Casino opened, and we're still getting major exposés purporting to tell the "astonishing" real story. Controversy about the Mashantuckets appears to be as reliable as the hundreds of millions of dollars in revenue the state takes in annually from their slot machines. And 20 years after the Pequots convinced Congress to grant them federal recognition, it only gets uglier. This time, it's an investigative reporter with big-city cred taking aim at the tribe. Whether or not you fully believe this tale by a former reporter for The Washington Post and Fortune magazine, Fromson's book lands like a kick to the groin, ridiculing the tribe's most valuable commodity: its Indian-ness. The rhetoric may be old news to those who follow Indian politics in southeastern Connecticut. But it may be difficult for tribal leaders to ignore this broadside because here it's the Pequots who say some of the most damaging stuff. That in itself makes the well-researched and tightly written "Hitting the Jackpot" worth reading, because tribal members rarely speak publicly, let alone in such frank manner. "The only reason why a lot of people are here is for the money. We did not need to come here to feel that we had some Indian identity," states Theresa Casanova, a tribal member quoted liberally in the book. "Money is what this tribe is about. We are here because of the money." Another tribal member, Bruce Kirchner, adds, "We are the first tribe in American history to be formed around money." And an unnamed insider goes further, saying, "If the money spigot stops, the members will in large part drift away in different directions." Notably absent in the book are tribal members who might dispute Kirchner's and Casanova's view of the world. The reader is left to assume there aren't any, or at least any who would cooperate with Fromson's research. So Fromson makes hay where he can, such as illustrating what happens when poorly educated people who were just scraping by are suddenly earning six-figure incomes. 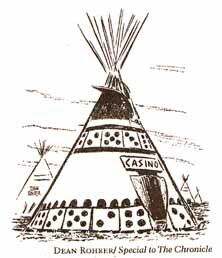 He writes that Jean Swift, a Mashantucket, left the Ledyard reservation because of the "high-class welfare system" the gambling fortune has created for the 600-member tribe. "There is such a high level of dysfunctionality in so many of the tribal members now with all of this wealth and opulence ... I found people whose entire lives were consumed by money. If was like they had gone crazy," Swift says. Of course, targeting the Pequots for their worship of the almighty dollar seems more than a little disingenuous. There are plenty of non-Indians in our state's non-tribal reservations of wealth -- say, the Farmington Valley and Fromson's own Fairfield County, for example -- where lives are equally twisted and warped by money. Gosh, these BMW-driving Indians are corrupted by money and don't know anything about where they came from; what's so astonishing about that in 21st-century America? And some tribal political leaders have questionable and even criminal connections in their backgrounds. This is unique? Maybe Fromson should look at some of Connecticut's elected leaders and politicians. For those new to Indian Country, Fromson's relatively slim volume of 244 pages is organized in quick-to-read chapters. It offers a useful history lesson on modern Native American gaming and tribal recognition. That is, until he dissects the bitter divide between lighter- and darker-skinned tribal members. He goes on to detail the frequent infighting between the Sebastian and Hayward families. He lists the criminal backgrounds of some tribal members, and, of course, he repeats the frequently heard criticism that the Pequots aren't really Indians at all. This is where Fromson moves in for the kill. Unfortunately, he falls back on the anonymous sources that typically flesh out these arguments. "This is a tribe where most members, by ancestry, are at least 63/64th something other than Pequot," Fromson writes. He quotes an unnamed member of the tribal museum design team who says, "these people are mainly something other than Pequot. And some of them may not be Pequot at all." Yet another nameless "professor of anthropology" repeats that "the moment that their link with the Pequots of the past is severed, we would all hit on that lack of connection, and they might lose their legal status as a tribe, and they might lose Foxwoods." Really? It would be nice to see a little more proof of a plausible scenario in which Indian tribes would ever stand back and allow one of their own to be decertified. It isn't going to happen. Fromson demonstrates his ability to follow the money trail in describing the financial problems that plagued the tribe during the late 1990s, when it was forced to cut back on the generous stipends it hands out to members. He also touches on some of the lesser-told and more fascinating dilemmas facing the Mashantuckets, such as the difficulty in "repatriating" members of a tribe that was at best dormant and at worst extinct. More on this would have made for a more remarkable book, as would a little more context about the complicated history that brought African Americans and Native Americans together, particularly in New England. Skip Hayward, former -- and perhaps future -- tribal chairman and father of the modern Mashantuckets, comes off better than other tribal leaders, such as Kenny Reels and Michael Thomas. But even Hayward, who transformed a gravel pit into the world's largest casino, is rarely described in the book when he isn't "too hung over" or presiding over "boozy" meetings and dinners. "If you can say anything about Pequot culture, it is that they believe that the genie in the lamp will always bring more money and that all they have to do is rub the lamp correctly to have it happen." In the past, tribal leaders have sought to aggressively dispute criticism by other authors. One looks forward to their response to this book. No doubt that will make for more astonishing reading.